One of my definitions of a geek is someone who introduces us to brave new worlds with visions of the future. What better fits that definition of a geek than an astronaut. As I explored a collection of NASA images I came across the STS-63 Crew Portrait. What immediately caught my attention about the STS-63 Crew Portrait was the diversity of the crew. An African American, two women, and a Cosmonaut were among the six crew members. I was gathering information to do an article for Geek History on women astronauts. 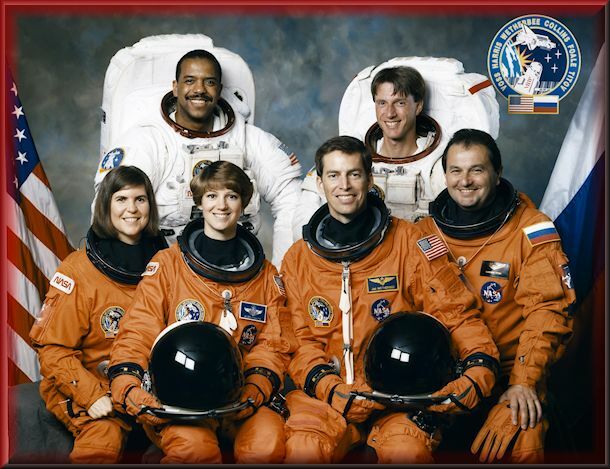 As I learned about the crew members and mission of STS-63, I discovered a mission of many milestones and amazing crew members. During the flight, Mission Specialist Bernard Harris became the first African-American to walk in space and fellow Mission Specialist Michael Foale became the first British-born spacewalker. The mission had another first as Eileen Collins became the first woman to pilot a Space Shuttle. Mission STS-63 aboard Space Shuttle Discovery launched from Kennedy Space Center on February 3, 1995. The mission was also a symbol of international cooperation with a primary objective to perform a rendezvous and fly around the Russian space station Mir. The War of Currents was a great science and technology feud in the late 1800s between the Edison Electric Light Company and Westinghouse Electric Company over what electric power transmission system should be used. The Westinghouse Electric Company supported AC (alternating current) and the Edison Electric Light Company supported DC (direct current). The internet loves to portray the battle as one between rival inventors Thomas Edison and Nikola Tesla. 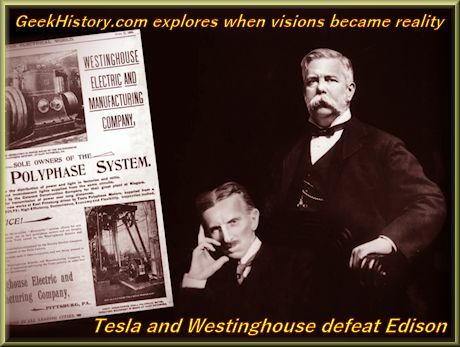 It makes for a good story of the hero, Tesla, defeating his rival, Edison. Both Edison and Tesla were well known at the time, and both a bit crazy.Thomas Edison was a well known inventor riding his success and media attention for inventing the phonograph. Edison leveraged his name and fame to start building DC power plants in New York City. 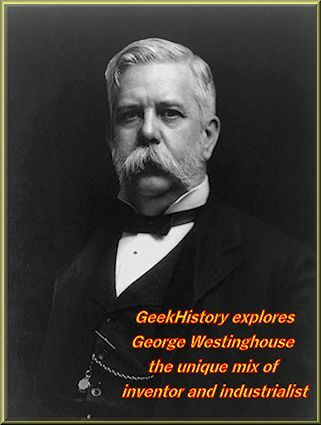 Westinghouse, unlike his rival Edison, did not seek media attention, and was a very private person. The battle for public opinion over which system should be used to power America turned into a nasty smear campaign by Edison. An inventor and electrical engineer named Harold Brown became the front man for a campaign to show the world the dangers of alternating current. Stories are told of how Brown paid local children to collect stray dogs off the street that he used for experiments showing the dangers of alternating current. Despite publicly denouncing capital punishment, Edison secretly financed the alternating current electric chair developed by Brown. Edison launched a media campaign telling the world AC was deadly, using the word "Westinghoused" to describe an execution by electrocution.